While the R8 received a minor refresh a few years ago, 2017 marks the first full redesign for the mid-engine supercar. Gone is the V8 version, with only two versions of the more powerful V10 engine left. Styling on the car has evolved with the times, the 2017 R8 looking lower, meaner and more modern than the model that preceded it. The R8's iconic carbon fiber "Blades" have been removed from the side of the vehicle in favor of a more conventional twin intake design, leaving the R8's profile more coherent and mature than in years past. One thing that hasn't changed is out-of-this-world performance. The R8 still has the chops to go toe to toe with some of the fastest cars in the world, now it just looks a little bit better while doing so. 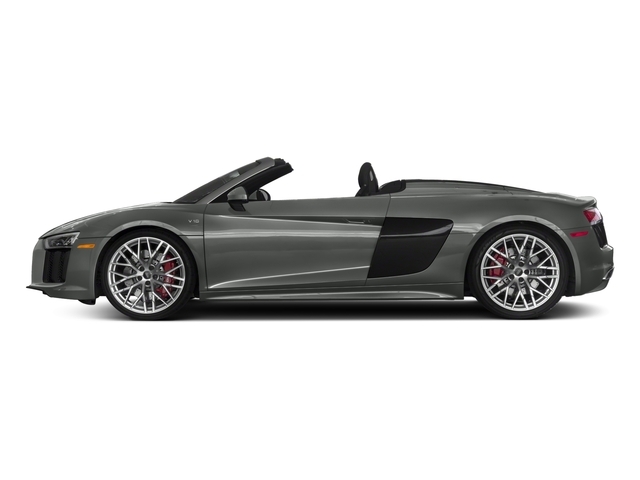 Supercars are generally defined by their engines and the Audi R8 is no different. The 5.2L V10 engine has been given some upgrades for the 2017 model year and the result is 540 hp and 398 lb-ft of torque. It's a combination that is good for a top speed of 199 mph. For those that absolutely must have a car capable of 200 mph, the V10 Plus model features a 610 hp version of the V10. Top speed is rated at 205 mph for the Plus model. All-wheel drive is standard across the entire lineup as is a 7-speed S-tronic gearbox. Audi estimates that the base version will hit 60 mph in 3.5 seconds, or 3.2 seconds for the Plus version. Keeping things in control are magnetic shock absorbers, which use magnets suspended in fluid to instantly adjust suspension firmness on the fly. Bumps can thusly be dealt with as they are encountered, with the kind of speed that would've been impossible several years ago. 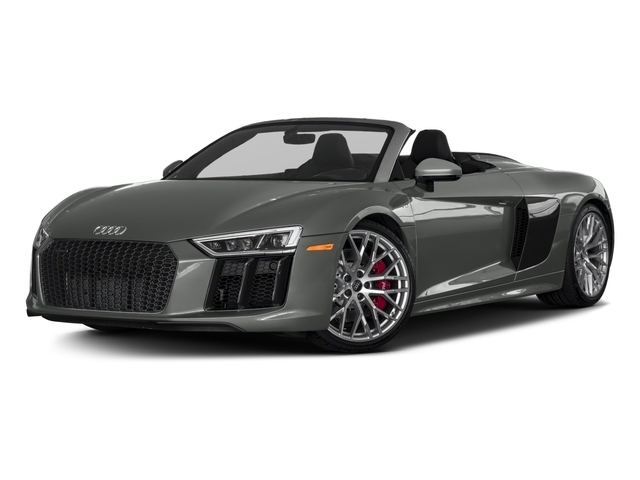 Magnetic shocks also allow the R8 to be driven in one of four different modes, comfort, auto, dynamic and individual, meaning that the right setting for the conditions and for the driver's mood can always be found. The Audi R8 is a sports car first and foremost, but that doesn't mean that it's an awful place to be, in fact it actually makes for quite a comfortable long distance cruiser. Standard features include Audi's AudiConnect infotainment system, a 550 Watt Bang & Olufsen Sound system, a multifunction steering wheel, heated, 18-way power adjustable sports seats, an Alcantara headliner, leather seating and automatic climate control. Standard exterior features include 19-inch wheels, LED headlights, taillights and daytime running lights, power folding exterior mirrors and a parking assist system with a rearview camera. The V10 Plus is of course slightly more performance oriented, so it actually sacrifices the stereo in favor of a lighter 5-speaker system and adds carbon fiber seats and door sills for less weight and by extension, more speed. The V10 Plus also gets a special "performance mode" which will adjust the traction control and stability control to aid the driver during high speed driving around a race track. 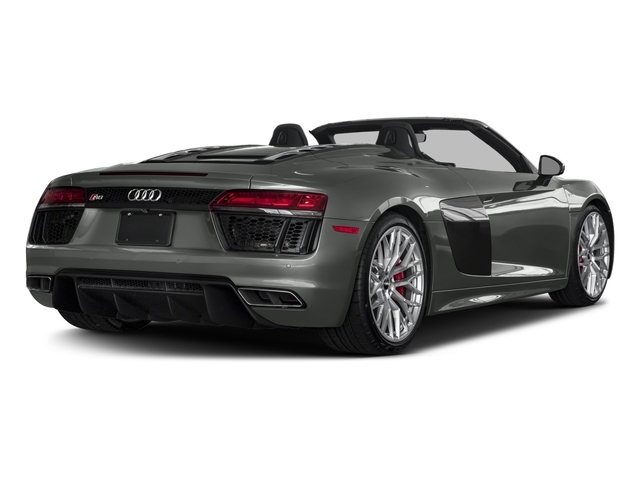 The Audi R8 starts at nearly $163,000. It is by no means an inexpensive car, though unlike some other supercars, its price is not inflated by frivolous amenities, badges and plaques. Consider this: the Audi R8 shares its engine and platform with the Lamborghini Huracan, a car with a base price right around $200,000. So the R8 is not cheap, but it is cheaper than some notable competition. It also manages to look far more exciting than any equivalently priced Porsche 911, adding value for those who care about looking fast in addition to going fast. Auto-Shift Manual w/OD Trans Description Cont.